Beautiful fleece and LOTS of it! Nearly 12 LBS. 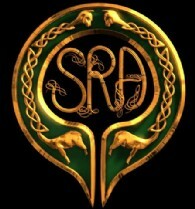 in 2007! 2018-06-04 25.6 6.2 24.2 SF 25.6 CF 81.6%, staple 60.8mm curve 35.8mm, sheared 6.375 lbs. 6/5/17 23.7 5.6 23.5 CF 87.6%, SF 23.6, staple 62.8mm, cuver 39.3, sheared 5.89 lbs. 6/9/15 22.8 5.7 25.1 CF 90.7%, staple 57.8mm, curve 37.5, sheared 5.03 lbs. 6/11/14 23.4 5.7 24.5 CF 88.9%, staple 59.8mm, curve 39.6, sheared 6.4 lbs. 6/12/13 25.1 5.6 22.3 CF 84.8, staple 70.4mm, curve 35.6, sheared 7.25 lbs. 5/28/2011 30.0 6.0 20.0 43.3% > 30, sheared 10.33 lbs. 5/26/10 (8yrs) 27.9 5.4 19.3 CF 71.8, Sheared 10.8 lbs. Jun 2 2009 (7 yrs) 32.3 6.1 18.8 CF 42.9, Sheared 11.28 lbs. May 31 2008 Sheared 11.33 lbs. Jun 5 2005 (3 yrs) 26.7 5.5 20.8 CF 76.8 CRV 35.5 Sheared 11.4 lbs. Jun 5 2004 (2 yrs) 22.2 4.5 20.3 CF 95.6 CRV 36.4 Sheared 8.44 lbs. Caligula son. 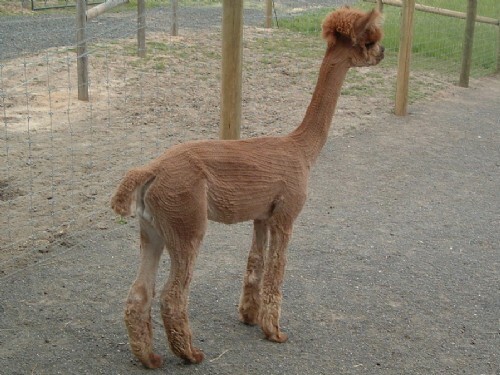 Stamps his distinctive head on his cria. Our dear Kupcake, first girl we bought, died May 2, 2016. She was a beautiful girl and it won't seem the same on the farm without this old matriarch. The Lord gives, and the Lord takes away, blessed be the name of the Lord! She had a good life and served us very well. We will miss her. 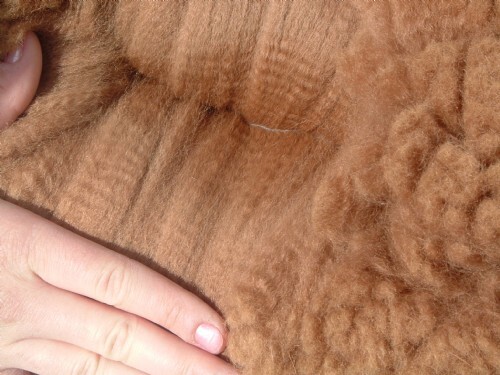 At 16+ years at last shearing, Kupcake has a 23 micron fleece and still is one of our heaviest shearing weights! We recommend breeding her to Snowmass Snow Legend--and her price includes a breeding to your choice of selected studs of which Snow Legend is one. Kupcake is a favored jewel on our farm. We have two particularly lovely daughters of hers, Vanora and Kenzie, and having them is the only reason we would part with Kupcake. 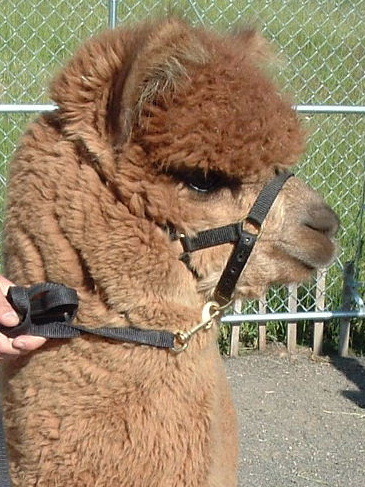 Kupcake was the 2000 CABA Reserve Color Champion. This is the girl we started our farm with. She's proven herself 6X for us and is an excellent dam, producing some of the best cria in our herd. Her last daughter, Vanora, currently has a 17 micron, 98% CF in her SIXTH year! 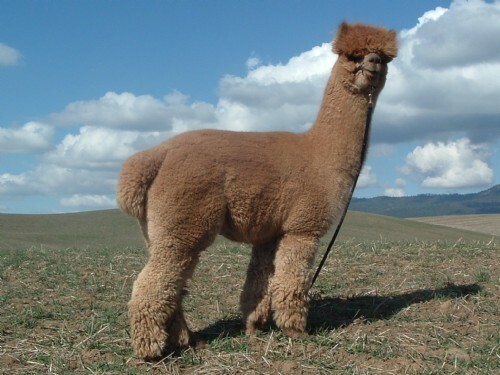 100% Bolivian, thick boned, solid conformation, pretty head with dark points, vicuna coloring on legs and underside and heavy, crimpy fleece. She's passed her hefty shearing weights and fleece character down to her cria. Kupcake is an excellent production female: easy to get pregnant, easy births, attentive mother with lots of milk, thriving cria with excellent weight gain and high IgG scores. Nice boy! And in very good shape for his 15 years. Still frisky, still able to breed. Not too shabby for a 15-year-old! If you buy Duncan, we will bring him to WSU for a breeding soundness exam and an updated health check. That is included in his price. If he doesn't check out, you don't buy, and no money will be exchanged. Or you will be given a full refund if you have paid. Promise! Click to see a copy of the CONTRACT for a herdsire breeding. If you are interested in purchasing Duncan, click to see a STUD PURCHASE CONTRACT. Duncan has packed nearly 12 lbs. 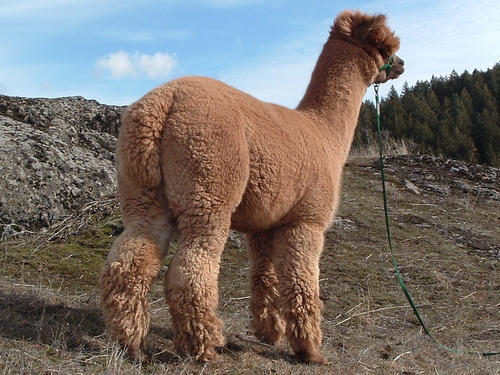 of dense fleece on his compact frame in his earlier years. Now 13 years old, he's still shearing heavy. His histogram is very decent for his age. There's no doubt about the improvement he's made on the girls he's been bred to by putting LOTS more crimpy fleece and a very pretty head on each of his babies. 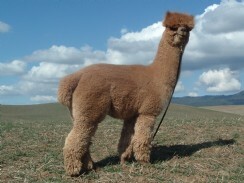 We are very pleased to say that Premier Alpacas (of Absolute and Rubio fame) has used Duncan. Their website states they have "incorporated these noteworthy bloodlines in our breeding program" of which Duncan is one. That is a huge compliment. Thank you! His DRIVE-BY stud fee is $400. For a breeding that includes 2 months boarding and 5 ultrasounds at WSU (valued at $250) and the expertise of Dr. Tibary at WSU, with travel back and forth to WSU, add $350. 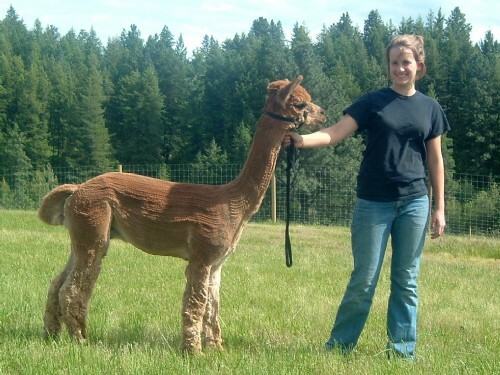 We provide a large quarantine pen for your female and cria. For their protection, they are not mixed with our animals or any other visiting animals.